Algerian President Abdelaziz Bouteflika, pictured in 2012, is bowing to months of intense protests in announcing his resignation. The country's leader has been in power since 1999 but has rarely appeared in public in recent years, since suffering a stroke in 2013. Algerian President Abdelaziz Bouteflika, the target of intense and prolonged protests, will step down before April 28, state media report, citing a message sent from the president's office. The 82-year-old leader had said he planned to run for a fifth term — angering thousands of people who churned in Algeria's streets — before reversing that decision. But when he announced he had changed his mind, Bouteflika also delayed an election that had been set for this month, stoking fears that he indeed would cling to power. 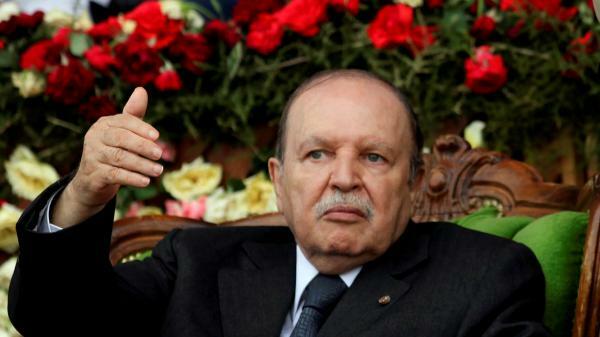 Now, Bouteflika's office says, the government will enter a new "transition" phase, the Algeria Press Service reports. News of Bouteflika's plan to leave office comes a day after he appointed a new government of 27 ministers, headed by Prime Minister Noureddine Bedoui. "The appointment of the new government on March 31st 2019 by his Excellency Abdelaziz Bouteflika, President of the Republic will be followed by important decisions he would take in accordance with the Constitutional Provisions, in order to ensure the continuity of the functioning of the State institutions during the transition period which will start on the date of the announcement of the resignation. "The resignation of the president of the Republic would occur before 28 April 2019, the date marking the term expiry." The seismic shifts emanating from Bouteflika's office over the past month have prompted critics to question the legality of the president's decision to unilaterally postpone national elections. Bouteflika has been in power since 1999 but has been largely absent from the public eye after suffering a stroke in 2013. Rather than attending public events, the president was often represented at government events by only a framed portrait of him. Critics also have have accused members of Bouteflika's party and the military of using the president as a figurehead to maintain their grip on power. Bouteflika's party, the National Liberation Front, has dominated Algeria's politics since the country gained independence from France in 1962. When Bouteflika bowed to protests last month and revoked his candidacy, the move was met with muted celebrations among opposition parties — particularly because he postponed a presidential election that had been slated for April 18. His pledge also stopped short of meeting protesters' demands that he leave office immediately. Demonstrators have accused Bouteflika of leading an unresponsive government that allows corruption to prosper while the national economy stagnates. Last month, as the elderly leader laid his plans to exit the presidency, he also announced a national conference that would review possible reforms for Algeria's political system. That conference will produce a draft constitution subject to a popular referendum, he said, adding that the body should "strive" to complete its work by the end of the year.